The projects of the Swiss artist duo Petra Elena Köhle and Nicolas Vermot Petit-Outhenin are distinguished by attempts to re-create history; they revolve around the pursuit and reconstruction of traces of historical moments. The basis of and key to the works of their series Kunst-Luftschutz-Massnahme (Art–Anti-Air-Raid–Measure) are archival photos from the 1940s. They document how during World War II monuments and sculptures were protected against destruction, for example, by being moved elsewhere or walled in. In stagelike installations, Köhle / Vermot evoke these measures materially and formally as spatial constructions. They take a similar approach in their work entitled Führerauftrag (Führer's Commission). Already on the defensive, Hitler had ordered photographs to be taken of immovable cultural assets, for example, murals, so that they would at least be visually protected against loss. Köhle / Vermot are interested in the archival images that show those photographers at work, that is, in the improvised settings of the often hastily commissioned conservation measures. The artist duo's installations clearly have to do with the act of selective history writing and a rereading of its conditions and consequences. Their analytical works constantly weave at least four different planes together: the past setting of the original event and the current site of the exhibition, the event's historical origins, and the perspective from which it is appropriated today. 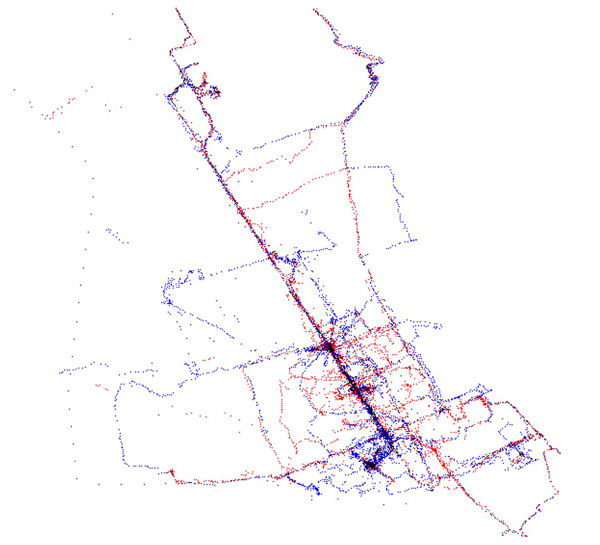 In the spring of 2007, within the framework of a test set-up designed for this purpose, Petra Köhle and Nicolas Vermot traveled separately for 21 days to Palermo where they recorded their respective routes and activities in detail, given that they had to be able to verify later where they were located at every moment of their stay. Supplied with GPS and dictaphone, with camera and note pad, the two of them wandered through the Sicilian city with the goal of determining if two people who want to encounter each other actually meet somewhere, sometime in a metropolitan setting with an area of 22'000 soccer fields – even if the rules of the game forbid the systematic search for the other person. A wealth of documents consequently accumulated (diary entries, photographs, recordings, videos), which collectively yield a portrait of the city of Palermo contrasting sharply to a tourist's view. At the same time they also document the moods and thoughts of the two protagonists moving around in this foreign city alone, but always having in mind a possible encounter with the other. Consequently the soberly established rules produce a situation where they both have to come to terms with their foreignness, loneliness and longing; a situation that provokes inner monologues about accidental or fateful encounters, about searching and hunting, about rules and the breaking of them. The lecture is subject to a framework of rules in which the reading of parts of our protocols overlap with the projection of slides and the replaying of recorded texts. Both of us have their voice and a device to communicate. Since it is not a completely organized choreography but a setting in which the protagonists have choices the lecture is different each time. The project was published in book form, and an English translation of the texts is available online. There, where I should have been yesterday. I am here today. Installation in various media, lecture performance, 2007-2012.